When I think of Sicilian wine, I envision Nero d’Avola grape, its most notable indigenous grape. Sicily’s wine industry started as a bulk wine producing region, but sometime in the 1990s, this conception changed. 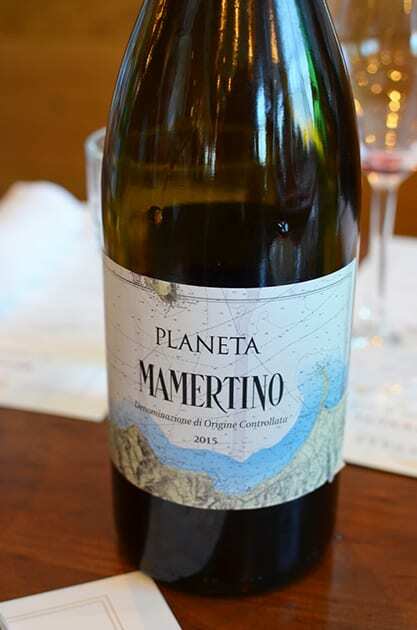 Planeta, whose history in agriculture goes back 400 years was one of the wineries to make this change and to put the Nero d’Avola grape on the map. With Planeta’s history dating back five centuries and 17 generations, the family has been in some form of agriculture throughout that time. In the 1990s the family’s small winery became a cooperative. Later the family played a vital role in changing Sicily’s approach to grape growing. They moved from a bulk grape producer for mainland Italy to establishing a focus on producing high-quality wines. In 1985 Planeta planted their first vines in Ulmo and by 1995 built their first winery in the same location. Today the winery has grown to encompass five regions, Menfi, Vittoria, Noto, Etna and Capo Milazzo and six wineries in Sicily. The Nero d’Avola grape is the most important grape of Sicily. It is named after the town of Avola in southeast Sicily. Today the grape grows throughout the various regions of Sicily. The grape is dark skinned, thus its name Nero d’Avola, which means Black of Avola, a reference to its color and original location in Sicily. 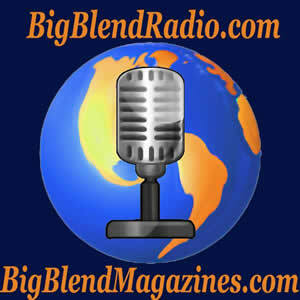 It originally was used as a blending grape. Today it is often compared to Syrah because of the similar growing conditions for both grapes. One finds characteristics of high tannins, medium acid and lots of body that allows for excellent aging potential with Nera d’Avola. Each region gives different flavors profiles to the Nero d’Avola grape. In Menfi the clay and calcareous soils produce flavors of plum, chocolate, and mint. The wine seems livelier. In Vittoria, a younger vineyard, the soils are sandy and calcareous gives the wine a fresh outlook with flavors of strawberry and cherry. Noto is at the southern tip of Sicily, enabling Planeta to produce a Nero d’Avola from the region of the grape’s origin. With Calcareous soils, the wine promotes intense flavors of black currant, cocoa and balsamic. 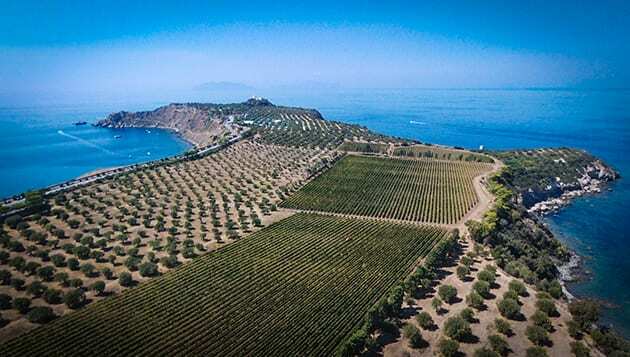 In Capo Milazzo, the soils are alluvial which gives way to black cherry, citrus, tamarind, seaweed, and velvety textures. 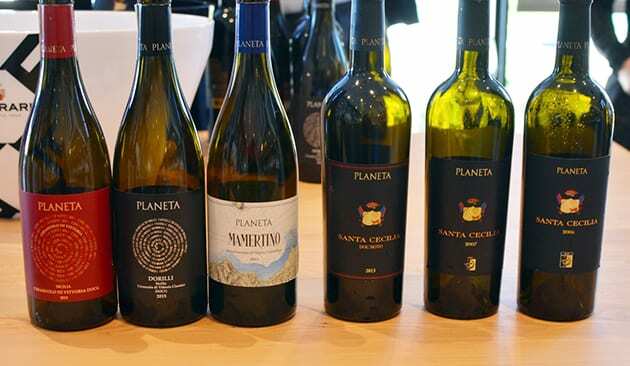 At a recent tasting of the Planeta wines, hosted by Alessio Planeta, I sampled several different Nero d’Avola wines from different regions of Sicily. Each wine showed the diversity of this grape. Alessio Planeta sharing Nero d’Avola. Cerasuolo Di Vittoria DOCG 2015: I found a very drinkable wine that fits any season. Composed of 60% Nero d’Avola and 40% Frappato, the wine ages in stainless steel making it a lighter wine that emphasizes this younger vineyard in Vittoria. On the nose, I discovered cherry and beautiful perfumes. On the palate, the wine exhibited tart strawberry and cherry. One tastes the influence the Frappata imbues in the wine. Dorilli 2015 Cerasuolo Di Vittoria Classico DOCG: This wine consists of 70% Nero d’Avola and 30% Frappato. After fermentation in steel vats the wine ages for 12 months in large wood barrels. From the aromas, I evidenced more depth to this wine along with strawberries. The wine exhibited flavors of strawberry and cherry and is more rounded. 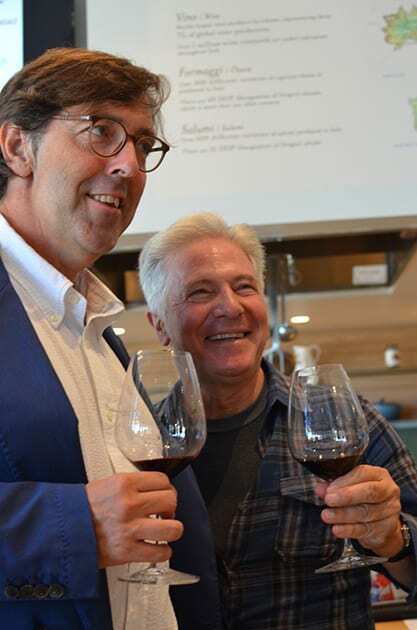 Mamertino DOC 2015: The wine consists of 60% Nero d’Avola and 40% Nocera. Following fermentation, the wine ages 12 months in oak barrels. I found an earthy quality on the nose and soft velvety textures on the palate. This wine opens up beautifully as it airs a bit. A percentage of the proceeds from the sale of this wine goes to a charity for children in the Milazzo area. Santo Cecilia 2013 Noto DOC: This wine signifies the origin of the Nero d’Avola grape. Avola is a village near Noto. The wine ages 14 months in barrels. I found saline aromas and a rounded wine with flavors of cherry. Santa Cecilia 2007 IGT Sicilia: This wine was produced a year before the area received its DOC classification. You can sense the effects of the vineyards proximity to the ocean. This wine ages 14 months in 2, 3 and 4-year-old barrels. The wine is earthy and rich with flavors of bright cherry. This wine was a favorite. Santa Cecilia 2005 IGT Sicilia: Aged 14 months in 2 and 3-year-old barrels, this wine displayed a richer more substantial and heartier wine with herbal notes. During our luncheon, we also sampled the Le Segreta 2016, a very young wine that ages in stainless steel and a marvelously sweet and savory Rose composed of Syrah and Nero d’Avola. The Nero d’Avola grape stands out as one of Italy’s rising stars and certainly reflects the evolution of Sicilian wine throughout the last several decades. Note: Featured photo courtesy of Taub Family Selections. 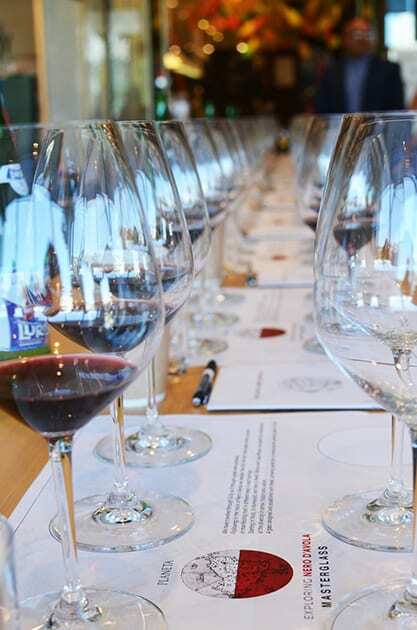 Note: Common to the wine industry, this writer attended a hosted wine tasting. While it has not influenced this review, the writer believes in full disclosure.